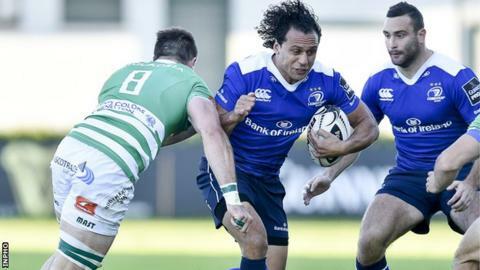 Leinster picked up a bonus point as they moved up to fourth place in the Pro12 table by beating Treviso to seal their first away win of the season. For the Italian side, it was their 13th consecutive Pro12 defeat. Jack McGrath's early try set Leinster on their way and Isa Nacewa, Jack Conan and Ben Te'o also crossed the line. Jonathan Sexton marked his return to Leinster after his spell at Racing Metro by landing a conversion, while Fergus McFadden kicked five points. A Jayden Hayward penalty was all that Treviso could offer at Stadio Monigo as their winless streak extends from February when they beat Cardiff Blues at home. The visitors took a third minute lead when they retained and recycled the ball, which enable McGrath to barrel his way over for the opening try. Sexton duly added the conversion, although Hayward narrowed the deficit to 7-3 soon after with a penalty. Treviso then had a golden opportunity to push on as Sexton spent 10 minutes in the sin-bin for a late tackle but they failed to capitalise on the numerical advantage. They did manage to pile the pressure on their visitors but an excellent tackle from Dave Kearney won a penalty before a huge hit from Nacewa forced a knock-on from Luke McLean. Even when Sexton returned to action the Italians, who had only beaten Leinster once in a dozen previous encounters, thought they had scored a try after mauling their way over in the corner but the Television Match Official (TMO) ruled otherwise. In a concerning moment for the Irish province, Luke Fitzgerald was forced off with a shoulder injury but McFadden extended their advantage to seven points with a 33rd-minute penalty. And despite Treviso's dominance in the first period, Leinster went into the break 15-3 ahead as, with the last play of that half, Sexton's pinpoint cross-field kick following a line-out picked out Kearney who fed the ball inside to Nacewa for the try. The story of the first half was Leinster standing firm in the face of home pressure and that continued after the interval as Rhys Ruddock and McFadden forced a knock-on from the hosts in an attacking position. The visitors then punished the Italian profligacy on 56 minutes as lightning-quick hands from Jordi Murphy, Nacewa and Kearney released Conan to cross the whitewash. Ludovico Nitoglia was then sin-binned for a deliberate knock-on and Te'o capitalised - the centre making an incisive break and dotting down for the try his impressive performance deserved. With the bonus point wrapped up, the visitors took their foot off the pedal but still cruised to victory as Treviso's winless run against Irish provinces since they beat Connacht in October 2013 continued. Benetton Treviso: Jayden Hayward, Ludovico Nitoglia, Andrea Pratichetti, Sam Christie, Simone Rugusi, Luke McLean, Edoardo Gori, Abraham Steyn, Alessandro Zanni (capt), Francesco Minto, Teofilo Paulo, Marco Fuser, Rupert Harden, Davide Giazzon, Matteo Zanusso. Replacements: Luca Bigi, Alberto De Marchi, Simone Ferrari, Jeff Montauriol, Robert Barbieri, Chris Smylie, James Ambrosini, Tommaso Iannone. Leinster: Isa Nacewa (capt), Fergus McFadden, Ben Te'o, Luke Fitzgerald, Dave Kearney, Johnny Sexton, Eoin Reddan, Jack McGrath, Sean Cronin, Tadhg Furlong, Hayden Triggs, Mike McCarthy, Rhys Ruddock, Jordi Murphy, Jack Conan. Replacements: Richardt Strauss, Cian Healy, Marty Moore, Devin Toner, Josh van der Flier, Luke McGrath, Cathal Marsh, Noel Reid.